Nick Gordon denies he is dating his “sister” Bobbi Kristina Brown, but he says they are “just close”. Last week ,HollywoodLife.com reported that Bobbi Kristina Brown and Nick Gordon were holding hands and kissing on the lips while shopping at Target near their home in Johns Creek, Georgia. “We’re just close,” Nicholas Gordon told ABC. On March 9, Bobbi Kristina and Nick Gordon were also spotted walking around Target and kissing on the lips and holding hands, which clearly showed the two are more than just friends. Nick Gordon is not blood related in any way to Bobbi Kristina Brown, but Whitney Houston took him in 10 years ago when his dad went to prison. Bobbi Kristina and Nick Gordon have been living in Whitney Houston’s town home in Atlanta for years and they’ve even tweeted that they sleep in the same bed sometimes. Plus, Nick Gordon’s grandmother told Star magazine that he is very close with Bobbi Kristina and took care of both her and Whitney Houston. In a report put out by E! 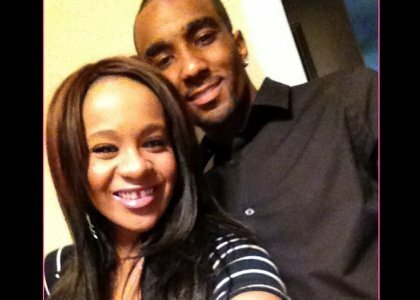 News, a source close to Bobbi Kristina Brown explained that Nick Gordon is a great person and friend and has always been supportive of the 19 year-old beauty. The insider also dished that the pair first met when they were younger, when Nick Gordon explained to Bobbi Kristina that he wanted to enlist in the army after high school due to family problems – but, to avoid this from happening, Whitney Houston stepped in to take him in as her own son. Since Whitney Houston fostered Nick Gordon, he has been the man of the house, and by the looks of his recent tweets, he feels the same way about this relationship.